Rocio Trevino of Royal Mail sent this message to me late last night. Translated from Spanish: BUTTERFLIES ENTERED TODAY TO MEXICO. COUNTED IN CIUDAD ACUNA 30/minute NOON TODAY. Ciudad Acuña is located along the Rio Grande, very close to the Mexico-United States border. I find the large numbers of Monarch coming through this location very interesting because the overwintering sites in the Trans-Mexican Volcanic Belt Pine-Oak Forests (slightly west of Mexico City) are just about directly south of Ciudad Acuña! If the Monarchs can take a mostly straight path between these two areas, it seems it would be an easier navigation job ("go directly south!") than it would be in other potential flyways. Also, I'm glad to get confirmation that the Monarchs are getting closer to their winter homes. 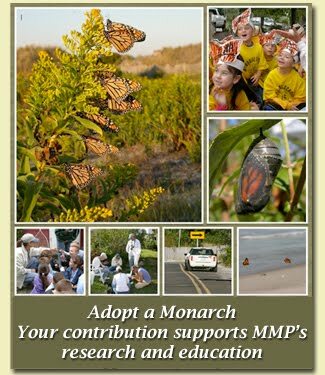 The first Monarchs should reach the overwintering sites in November, coinciding with local Mexican celebrations of Día de los Muertos (Day of the Dead).